In this week's edition of The Bleacher Briefings podcast, columnist Troy Ballard joins us to discuss happenings in the NBA playoffs, Cole Hamels welcoming Bryce Harper to the big leagues, the effect Junior Seau's death could have on the NFL, and the odds of the Floyd Mayweather-Manny Pacquiao fight actually going down! - NBA Playoff Chat: Defending champion Mavericks swept, Al Jefferson conceding defeat, Carmelo extending the Knicks season, and the 76ers looking to finish off the injury-riddled Bulls. We get you up to speed on everything NBA. - Crossing the Line? 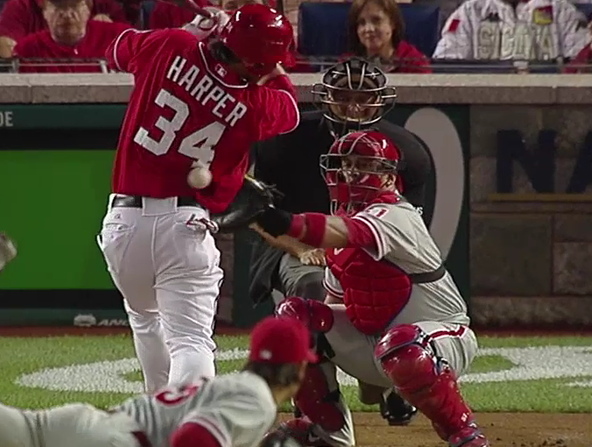 : Did Phillies starting pitcher Cole Hamels cross the line when he intentionally drilled rookie phenom Bryce Harper with a pitch on Sunday? Our answers may surprise you. - Death of an All-Time Great: Last week, 12-time Pro Bowl linebacker Junior Seau took his own life. What effects could his passing have on the impending lawsuit former NFL players currently have against the National Football League? - Mayweather Wins Again: On Saturday, Floyd Mayweather beat Miguel Cotto by unanimous-decision to add the WBA super welterweight title to his collection of belts. NOW will we see "Money" take on Manny Pacquiao, or is there a chance that Mayweather just retires? This was my first time listening to one of your podcasts. Not bad at all. They keep getting better and better guys. Keep up the good work. Thanks for listening guys. Appreciate it.